Home / Health / Does Hindu Eat Pork? Does Hindu Eat Pork? – the answer is No, they do not eat pork. But this ban of pork is not only practiced in Hinduism, but also in Islam and some other religions. But where does this ban of pork comes from? Does Hindu Eat Pork? 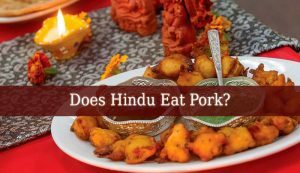 – Why Do Hindus Avoid Eating Pork? The main reason why Hindus do not eat pork is because of their religion. In Hinduism, vegetarianism is a very important aspect. This is how they keep themselves (their body and spirit) clean. Being vegetarian, they also avoid Karma and/or reincarnation as a lower creature than human beings. In Hinduism, eating pork is one of the most sinful acts. And if a Hindu eats pork, he will have to reincarnate several times, to be human being again. Another reason why Hindus and Indians in general don’t eat pork is because of the epidemics it causes. The pig is considered one of the dirtiest animals. Its meat is a great carrier for numerous illnesses, viruses and eggs. Many people get infected with ring worms, round worms and bacteria due to park meat. The meat is also a great environment to numerous pathogens. Provoking many epidemics all around the world. Also, there is a third reason why Hindus don’t eat pork. And it is due to the hot climate. Consuming pork raises the body’s temperature. Which is not a good thing in India. But, on the other hand, in the Himalayan regions, people consume pork in highly large quantities. The last reason that should be mention is that the deities forbid Hindus to eat pork, or meat in general. And I have a passage that sustains it which says: “Of one offers Me with love and devotion a leaf, a flower, a fruit or water, I will accept it” (Lord Krishna). This list of food to offer the deities doesn’t contain any kind of meat. Therefore, the deities don’t consider meat food. Promoting vegetarianism among the followers. In conclusion, the answer to the question Does Hindu Eat Pork? Is No. And there are numerous reasons why they avoid pork. But, in my opinion, the most powerful reason is that vegetarianism is the cleanest way to spiritual awareness. Next What Was An Effect Of The Crusades On The Muslim World?